Thanks NaaNaach for translating this excerpt from pg. 93. (Do you remember in Breslov they said, "Yisrael Ber already has no more worries about a livelihood. He brought close to Rabbainu such a rich man - Y.A." Saba, do you remember Y.A. in Tel Aviv?) Y.A. on Allenby, I met Y.A. the first time in the mikvah. Then, he was at my mikvah. I couldn't go in, hundreds of people were going in little water. I can't immerse in my mikvah. In the mikvah, I cannot immerse. How he had 1000 dollars and gave it for printing the books of Rabbainu. All the money, and he was left empty without money. After this, he got married to someone, he couldn't make a shidduch because he [only] wanted a beauty, unique in the world, that there isn't beauty like it in the world. Nu, and he took a wife..she has already passed away. She was ugly that there isn't in the world like it. So he said, "I need to take this shidduch for me." He has children from her. Everything that he had, all his money - only for the books of Rabbainu...He was by me in my house and he didn't have a wife or children. Now his wife is gone. And the children, he has good children, they learn in Bnei Brak by, what's his name..Rabbi Shimon. He [Y.A.] lives in Jerusalem? (Yes, in Jerusalem) Maybe we'll bring him here. How does he look, does he have a white beard? (Yes) We have a car, we have everything. Let's go look for Y.A. in Mekor Baruch or in Geula...His children are Breslov Hassidim learning in yeshiva. (Y.A. was by you in Uman?) Yes, with the children. He had a house in Zichron Moshe in Jerusalem, in Tel Aviv, Tel Aviv Nachum Street 5. 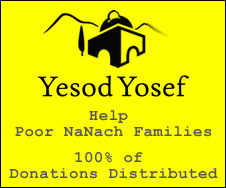 Let's search for him to bring him to Na Nach Nachma Nachman MeUman, Nachman MeUman...Y.A and his wife, he has 15 children...Y.A. and I were together in Jerusalem...let's have an outing in Jerusalem, we have a car, yes, we have drivers, only gasoline..we can travel day and night to publicize Rabbainu in all the Land of Israel. If I had lived in Jerusalem? (They [some of Saba's children] would have been religious?) Certainly! They would have learned in yeshivos, yes, they would have gotten married and they would have been religious, yes, they would have been religious, but I was a chacham [wise man], I said I want the responsibility to be on her, not on me, so I was a chacham and Rav Shlomo [Wexler] he screamed, he screamed at me with such screams, with anger, with strictness, "Only Jerusalem, Only Jerusalem!" I said, "What? He gives me dollars? He gives me money? What is this? Only faith and trust?!" I was a chacham, yes. I didn't listen to him and went to Tiberius and it happened, with the children and with... if only I had listened to Rav Shlomo, little by little I would have, I would have had more of an apartment, the children would have gotten married, they would have gotten married (And they would have been hereidim [very traditional Jews]?) Yes. They would have been hereidim and they would have been Torah scholars, bnei yeshivos [members of yeshivos]! I left everything, just Shlomo said to me - just faith and trust, do not leave Jerusalem for Tiberius, only faith and trust.